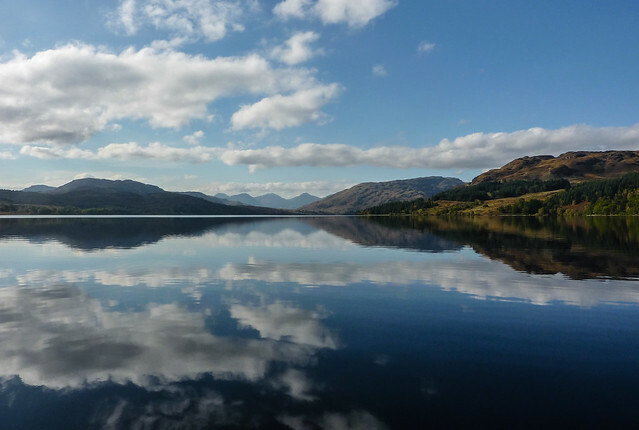 Photo of the Week: Reflections in Loch Katrine | Flights. Camera. Satisfaction. With the colours of Autumn starting to appear on the trees around Geneva, I’ve been thinking back to the trip we took last October. Driving through the Scottish Highlands was definitely one of the highlights of 2012 for me, and I’m so glad we went at this time of year. Although the colours weren’t perhaps at their best, the variety of yellows and greens on display was fabulous. And nowhere was this more apparent than Loch Katrine. We took a boat tour around the loch and the natural landscape in every direction was just stunning. The water was so calm and the reflections created as a result were mesmerizing. I was completely surprised by Scotland, I really did not expect it to be so beautiful! But it stole my travelling heart in many ways, and I can’t wait to return again. Here are four of my best shots from our hour on the loch. Which is your favourite? A, B, C or D? This entry was posted in Europe, Photography, Scotland and tagged Autumn, Loch Katrine, Photo of the week, Reflection, scotland, Travel on October 9, 2013 by Ben. Thanks Scott, I think we got pretty lucky with the weather. Having said that all of the lochs we visited were so tranquil, it was fantastic! Those are four beautiful shots you’ve got there, I love them all but D is my favourite. Thanks Rosie! I love the shape of the symmetry in D, it’s very uniform and pleasing to the eye. What did you do to get those reflections so clear? Was it the way you set your camera up or was it something you did in an image editor? I think I just got really lucky! I was using my old point and shoot at the time so had no real control over the settings, and I’ve pretty much just cropped them in post processing. They look exactly as it was on the day. Sometimes you’re just in the right place at the right time! I think generally for great reflection shots the most important thing is that it’s not too windy so that the water is still. And if possible you want the sun to be shining on your subject, but have the water in shade to reduce glare as much as possible. Wow you really did get lucky. I’d love to go to Scotland to see the lochs. C is probably my favourite. I was supposed to be in Scotland this month but life interfered. You were very lucky with the weather! I’ve been before but my partner hasn’t. My favourite photo from scotland is a view over Loch Caron from above, taken about 9 am with the early morning pinks filtering the golden sunlight. Oh that’s a shame you didn’t make it out there! I was certainly very lucky. I hope you have the chance to go again soon. I’ve not heard of Loch Caron, thanks for the tip! I’ll have to make that part of my itinerary for next time, it looks beautiful. Thanks Seth. It’s such a stunning area of an incredibly beautiful country. I can’t wait to go back some day!